ElectNext describes its mission like this: "Imagine if you could cast an informed vote in every one of your elections, all the way down your ballot. Rather than relying on party or guesswork, you could choose candidates based on knowledge." Despite the nonstop coverage of the ongoing Republican primary battle on cable news and talk radio programs, the American voter remains notoriously ill-informed. While people may be increasing their attention to the high-profile horse race of presidential politics this year, it’s clear that most voters’ knowledge of local politics has sharply declined. This is doubtless related to the dwindling amount of local news consumption among most Americans. A Pew Research Center report, which I recently cited, found that, for the first time ever, people are regularly getting their campaign news more from national cable news programs than from local television stations, and more from the Internet than from their local newspapers. Fortunately, at least two websites have emerged in this election cycle that hope to narrow the information gap and help voters decide on a candidate by surveying them on a host of questions and then matching them with the candidate whose policy positions accord most closely with their own. 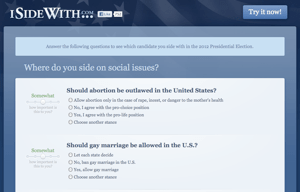 iSideWith offers a way for voters to connect with candidates based on issue-based questionnaires. If you’re like me, you’ve often walked into a polling booth on Election Day ready to pull the lever or push the button for the person running for president (or governor or senator), and then been confronted with dozens of names of candidates you never heard of for positions you didn’t know existed (“Tree Warden”? really?). What most of us do, in that case, is simply vote for whichever name shares our party affiliation and cross our fingers that they’re the right guy or gal for the job. Historian Rick Shenkman recently chronicled some examples of voter ignorance in his provocatively titled book “Just How Stupid Are We?“ (like the fact that most Americans can’t name their own member of Congress). And economist Bryan Caplan argued in “The Myth of the Rational Voter“ that most of us vote under the influence of faulty beliefs. 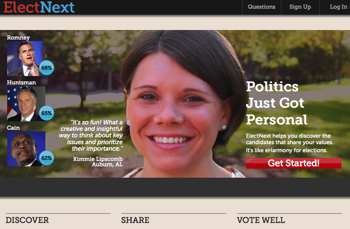 ElectNext and iSideWith.com have set out to correct that. When discussing how ElectNext matches voters with candidates, Dannenbaum pulled back the curtain for me. First, there’s a matching algorithm that calculates one’s closeness to a candidate based on the similarity of answers and the rank of importance that a person ascribes to each question (much like the way dating websites function). Then, there’s a dynamic survey algorithm that generates new questions based on your answers. This is how many computer-based standardized tests work. Finally, it has a “candidate profiling algorithm” using a political interest alliance graph that pulls data from the Federal Election Commission, special interest group ratings, and correlations among survey responses in its own database. While ElectNext uses sophisticated algorithms from diverse datasets (indeed, it’s in the process of hiring a “chief data scientist”) that may help it bring its site to scale, iSideWith takes a simpler and more straightforward approach. Peck and Boutelier conduct the editorial research on their own, evaluate the candidates’ positions by the “official statements” that they or their campaign make, and personally comb through every debate transcript. The guys at iSideWith also take pains to include little-known candidates from obscure political parties. (Don’t be surprised if the presidential candidate with whom you most closely align is Jimmy McMillan of the “Rent Is Too Damn High” party.) Peck complains that “the media has shut out third-party candidates in this election cycle. In South Carolina, Buddy Roemer was tied with Rick Perry in several polls but was never invited to the debates.” They hope that their users who get matched with lesser-known candidates might take a moment and research them.